About this object New York Congressman John W. Taylor served as the ninth Speaker of the House. On this date, Speaker of the House John W. Taylor of New York was born in Charlton, New York. 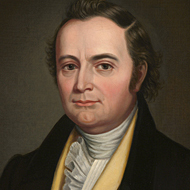 A lawyer by trade, Taylor served in the New York state assembly before his election in 1812 to the first of 10 consecutive terms in the U.S. House. At a time when regional party affiliations were in flux, Taylor—first elected as a Jeffersonian-Republican to the 13th Congress (1813–1815)—later served under the banner of several other parties: Adams-Clay Republican; Adams; and Anti-Jacksonian. Taylor won election as Speaker of the House in two non-consecutive terms, the 16th Congress (1819–1821) and 19th Congress (1825–1827)—succeeding the renowned Henry Clay of Kentucky on both occasions. As one of the early abolitionists in Congress, Taylor introduced resolutions to prohibit territories from entering the Union as slave states. He supported the Missouri Compromise of 1820, which restricted slave states above the 36/30 line (Mason-Dixon Line). He served with distinction and had a reputation for fairness as a presiding officer, but his abolitionist views made him a controversial figure. “I lost my third election as Speaker,” he explained to his son, “through my direct opposition to slavery.” Taylor remained a Member for several terms until local party leaders undermined his bid for re-election to the 23rd Congress (1833–1835). Taylor joined the Whig Party and served briefly in the New York state senate in the early 1840s until a stroke forced him to resign. In 1843, he moved to Cleveland, Ohio, where he resided with his daughter until his death in 1854.